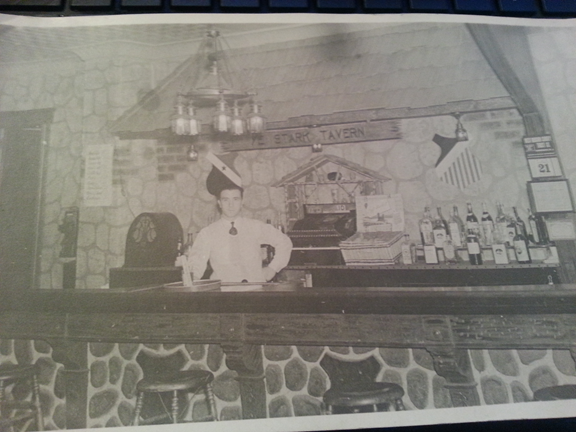 Archie Stark behind the bar at his Kearny Avenue tavern. Photo: Courtesy of Alyson Walters. In the spirit of Throwback Thursday, or #TBT as it’s designated on social media, #SASH would like to introduce a new feature. It will be a personal reflection on some person, place or artifact that sheds light on the long history of soccer in the United States. We hope SASH members, or others interested in American soccer history, will contact us to share their own reflections on the site. The first #TBT #SASH offering stems from one of the interview questions answered by Roger Allaway in SASH’s “Spotlight” series. When asked what his favorite artifact was in the now shuttered National Soccer Hall of Fame (NSHOF), Allaway responded with US women’s national team stalwart Kristine Lilly’s tiny pair of lime-green shoes. I had heard about Archie Stark before because he was the most prolific goal-scorer in the history of American soccer, but Huckel pointed out that he also owned a bar in Kearny, New Jersey after his long playing career was over. I knew Stark scored 67 goals for Bethlehem Steel during the 1924-25 American Soccer League season, but I didn’t know he pulled pints at a corner tavern at 75 Kearny Avenue, the main thoroughfare in a bustling mid-century working class town. Stark’s Tavern is no more because No. 75 is now a Portuguese restaurant. It still has a wooden sign above its door, but it reads “CHURRASQUEIRA.” Online reviews rate the eatery as the best Portuguese cuisine in the area—quite a feat considering the slew of offerings just across the Passaic River in the Portuguese-dominated Ironbound section of Newark. Stark is an interesting case because soccer certainly helped him find employment throughout his playing years, whether at one of the many factories in the Kearny area, or most notably as a draftsman at Bethlehem Steel during the peak of his playing days. But while he made more money playing than most due to ability to score lots of goals, he never made enough to retire early. He had to continue working both during his career and long afterwards. In fact, work got in the way of his participation in the inaugural World Cup in Uruguay in 1930. Archie surely would have been one of the first names on the team-sheet, but he declined an offer to set off for Montevideo because of his involvement in a new business venture. One of his several granddaughters elaborated in a recent interview, “The subject of his declining to play in the World Cup seems to always come up. I have never heard anything said about him regretting that decision . . . the mechanics garage he was setting up in nearby North Arlington was a business venture with his brother-in-law.” Family and work got in the way of potential World Cup glory because Stark would’ve no doubt contributed to the third-place finish in the 1930 tournament, still the best-ever placement for the United States. We tend to forget that soccer stars, whether from today or yesteryear, have to forge a career after the ball is last kicked. The wooden sign that was once in the archive room of the NSHOF attests to that. While I can’t go back in time and sit at a stool and listen to Archie Stark regale me with stories of his playing career, or his long life after he finished playing, I may just go into the building that once was home to his tavern. Perhaps I’ll have some Portuguese BBQ while I think about one of the most storied players in American soccer history. Let me know when you head over to 75 Kearny Ave. We’ll raise one for Archie. I’m in town teaching a spring history class at SBP. Let’s go to lunch soon. I stuck my head into the former “Archie Stark’s bar” one afternoon about five years ago. I wish that I had taken the time to ask the three guys at the bar if any of them had ever heard of someone named Archie Stark. I would have been surprised if they had.